We paid a visit to architect Giovanni Zuccon in his Roman office to talk with him about his latest creations, such as the Maestro of Apreamare or the Ferretti Altura 690, and about the designs he is working at. Whenever we have the pleasure of talking with him, he pours out ideas and considerations. For obvious reasons of space we publish a synthesis of what we talked about in this occasion, highlighting what we consider to be the essence of our conversation. Wait, I know where you want to get. It was not an outburst. I was just pointing out to someone's behavior that I personally consider disqualifying both for the professional who creates the design as well as for the yard who accepts to build it and to how this behavior is becoming widespread. It is disqualifying for the Owner as well whose final decision is solely based on the price. You see... I am not speaking of famous or well-known designers, on the contrary, in most cases they are architects or so-called designers and newly born yards that operate in this field for the first time. I said in most cases because, unfortunately, there are also distinguished architects and well-known yards. I think this behavior is shameful and disqualifying for the whole boating world because technical and stylistic evolution is slowed down. This behavior simply implies that a product is sold because its shape is potentially attractive. What, in your opinion, determines this behavior? Technical innovation requires a major ingredient, research. Nothing is obtained without adequate research, which means investing much money for something that might not be successful, dedicating much time and devoting oneself to it. These three elements go against the way of thinking of those who are just interested in profits. These people choose the fastest means to obtain the job and to create their product that, in the end, may be cheaper just because there is not the enormous research work that generated it. That's not all. I also think a cultural condition must be considered. You see, research implies the existence of another fundamental characteristic in the individual, modesty. Today it is more and more difficult to find someone who accepts to be challenged for improvement, for improving oneself. Today, our office includes about 30 persons, most of them young, who, my wife and I chose mainly on the basis of their research capability resulting from innate modesty. Being very good is not sufficient for growing if one is not willing to study and dig into a subject. Of course, basic competence is necessary but it is not enough. Take a soccer player for example, if he is an excellent player but cannot integrate in the team he won't obtain good results, neither for himself nor for the team. Excuse me, I would like to talk about the activities of your design studio, in particular about research. Well, research is rooted in my DNA. Joking apart, as university professor and researcher I cannot start a design without adequate and precise research. We almost finished organizing an electronic archive with all designs, ideas, drawings and references of the jobs done or even just carried out for research purposes since 1971, when my wife and I started working. To do this, we assigned a person exclusively to this job, who organizes and continually updates the archive. In this way, all our ideas are accessible, including those that came to nothing but that may serve as a basis for other ideas. We have two rooms full of drawings, notes, photographs, sketches and much more, they are the archive of our ideas and not only of accomplished designs. This new section will integrate and somewhat be of assistance to the activities of another part of our office, which I intentionally want to create elsewhere, nearby but separate and managed by persons who are not directly connected with Zuccon International Project activities. It will be a research laboratory in which a team is exclusively dedicated to research and innovation. Its activity will be different from the research activity we generally carry out when we create a new design; it will be pure research. Of course, this lab will be costly, it will need staff and equipment, but I'm convinced that for our work to be good we cannot disregard accurate, serious and continuous research. And so we go back to the initial concept, that is, the results of our researches and experiments produce innovations capable of becoming reality, a reality which someone wants to obtain in a different way, without going through all what must necessarily precede it to be worth something. I don't want you to tell me the first and last names of those who tread this shorter path, but it is true that we all realize how some ideas and even whole concepts are proposed under somebody else's name. Do you think there is a way of interrupting this process? I think journalists like you have the duty to condemn this behavior. 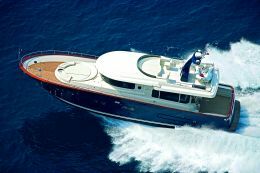 At least, in this way, readers - the potential buyers - will understand that by saving something on a slightly different design of an existing yacht they are not making a bargain because they are not buying the experience behind it and often this is backed by the yard. You see, my wife and I started our activity looking at the yachting world through magazines, in particular we started studying five issues of Nautica magazine. That was all we had and that is how we started but now, you see, we reached a condition in which we need rooms especially dedicated to research, they may be magazines or only brochures or photographs. We do not need this material to copy it, but to observe it and analyze it, to appreciate or discuss somebody else's work, to broaden our knowledge because this is the key. Increasing one's own knowledge and awareness is an endless process, we will never be able to say, "That's it, there is nothing more to know". I heard an anecdote on this... actually everything originated at a very informal meeting during which the question of the boat's name was put forward. 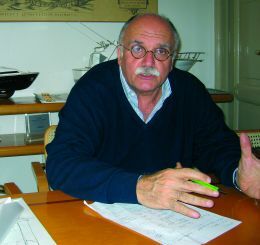 Eventually, as Cataldo Aprea, the yard owner, is such a well-known shipwright (maestro d'ascia in Italian) that some people call him Maestro, as during that meeting we spoke of the Mistral wind (Maestrale in Italian, originating from the word Maestro), and as she is the first boat of a range which undoubtedly represents a turning point in Aprea production, the name Maestro seemed most appropriate to express the emotions linked to that design. So, this means that other exemplars will follow the one we saw recently? Yes, we are considering a more compact unit and a bigger one. In short, the Maestro represents the first unit of a range. 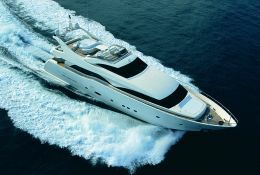 May I ask you how was the idea of the Ferretti Altura 690 born? It was an old idea, just like the concept that led to the Maestro. Originally they both were simple ideas and later they were elaborated and interpreted to obtain what we all see today. I submitted the design, rather, the idea, of the Altura 690 to Norberto Ferretti who readily appreciated it and let me develop it. One last question. To what extent is the statement that 'there is a return to more leisurely boats' true? This statement is certainly grounded. It is true that yards produce faster boats meaning that boaters ask for this type of vessels. 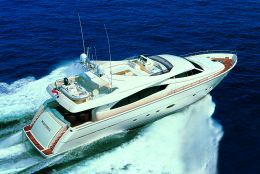 Nevertheless, it is also true that Owners wanting leisurely, comfortable, quiet and cheaper-to-manage yachts are starting to come up more and more frequently. 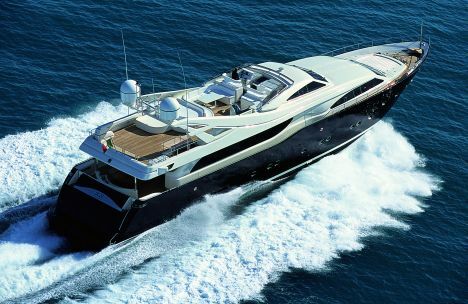 Let's take for example small ships, a vast clientele appreciates them, yet there are yards offering bigger yachts, with more powerful engines capable of reaching extremely high speeds. In conclusion, clients, in the global vision that we all should have, ask for any type of boat. Personally I have an Aprea double-ended boat and I love to sail at a leisurely speed of maximum 12-15 knots, but if my son is at the wheel everything changes. If within the same family there are different ways of sailing, imagine how many are the different owners and potential ones all over the world. After all, this is what makes of design a constant starting point and never a finishing line: there is always something to develop, to search for and to discover. Of course, I would like to design a displacement boat, not necessarily a maxi-yacht, whose main feature is comfort; the problem is that my desire clashes with the industrial reality, which has to make the figures balance. We talked with Giovanni Zuccon for a few more hours on the different aspects of design, on the boating world and on other matters, in particular automobiles that most interest him. Unfortunately for reasons of space we cannot publish the complete interview, nevertheless Architect Zuccon will write an article for us to be published on a Superyacht issue; then we will be able to get to know his ideas.